The Expert Consultation on Strengthening Linkages between Research and Extension to Promote Food and Nutrition Security, held in Bangkok on the 11th and 12th of December 2013, can be seen as the starting point for APAEON. 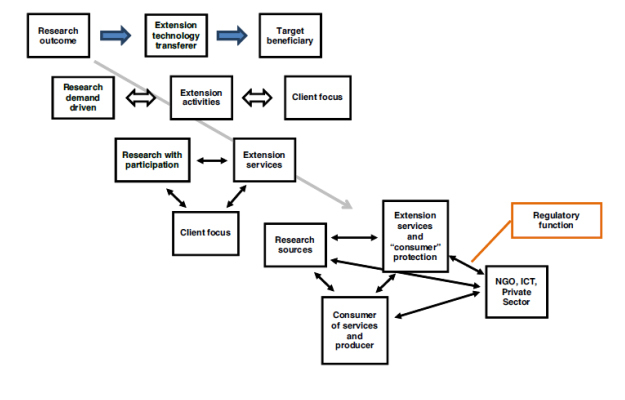 Agricultural research and extension systems have changed over the time from a top-down approach to a more interactive model which considers all involved stakeholders and their interrelations. With this new system approach it is necessary to integrate all concerned stakeholder, especially farmers, into the process to guarantee a successful implementation. Katinka Weinberger from CAPSA-ESCAP Indonesia therefore describes the new role of agricultural extension as a broker between famers and researchers. This requires particularly the share of knowledge as well as the building of capacities to address this issues. As a result of this expert consultation an Action Framework was developed to address the issue of strengthening the linkages of research and extension in the region. A main outcome, mentioned in this framework, was the intention to establish an Asian-Pacific regional network for agricultural extension service with a focus on enhancing the research and extension linkages. One year after the expert consultation on the 15th of December 2014 the “Asia Pacific Agricultural Extension and Outreach Network (APAEON)” was launched at the FAO Regional Office for Asia-Pacific in collaboration with UN CAPSA-ESCAP and APPARI under the presence of the Thai ministry of agriculture. The network includes governments, international/regional organizations, NGOs/CSOs and the private sector from the whole Asia-Pacific region. All of them dedicated themselves to strengthen the linkages between research and extension in the agricultural sector and to contribute to food and nutrition security as well as the enhancement of smallholder farmers livelihoods. APAEON is managed by one Chairperson who is elected every three years on a rotation base from one of the member countries. He is supported in his duties by two Vice-Chairperson, a Secretariat and the APAEON Executive Committee. One Vice-Chairperson is elected from one of the member countries the other one from an associated member organization. The executive committee consists of six experts in the field of research outreach and extension. The experts, one each, are coming from South Asia, Southeast Asia, East Asia, the Pacific member countries as well as a NGO and an international/regional associated partner. If necessary, a specialized committee can be established to work on a specific topic. Meetings of the members are convened annually by the Chairperson or on request of at least twenty percent of the members. APAEON members are also working closely together through video conferences, Skype, e-mails and other communication channels. Meetings are tried to be hold in conjunction with other events but in case of emerging issues the Chairperson may seek concurrence for convening an extraordinary meeting. For the annual meetings all members receive a notification at least one month prior and necessary documents at least two weeks prior. Decisions during a meeting, except of the application for membership and the election of the Chairperson and Vice-Chairpersons are taken by a minimum participation of half of the total number of participating countries. Travel costs to attend meetings and APAEON events are financed by the members. In exceptional cases, funding support may be provided according to availability. The general operational cost for APAEON are covered by voluntary contributions of the members and the hosting institution. The APAEON accepts sponsorship, financial contributions and donations for joint activities as appropriate. The executive committee consists of six experts on research and extension outreach from the APAEON members. The experts will be selected one each from South Asia, South East Asia, East Asia and the Pacific member countries. The other two experts will be drawn from an associated member partner as well as a non-governmental organization.